Owing to the heating system, which is outside of the mass of the product, using two burners, bitumen doesn't incur any change in standard, with regard to both mechanical and organical properties. Test results prove these affirmations. The unique heating system avoids loss of product. The capacity of our container – 20 feet ISO container - 23’000 litres of capacity – has better over-all and weight constraints than traditional road tankers. 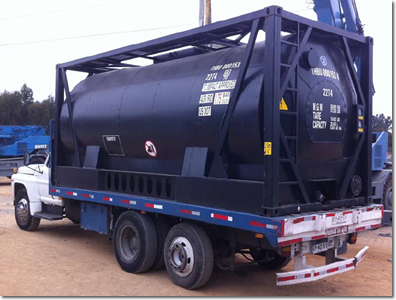 Our system allows the end-user to heat a large quantity of bitumen in a very short period of time, at a cheaper cost. Our THB®, in term of investment, is almost 4 times more cost effective compared to road tankers. Our THB® can be moved as an INTERMODAL transport network. In addition, our THB® is a smelter in itself, therefore avoiding investment in such equipment. Furthermore, due to the heating system, the heating cost is substantially lower compared to all other processes (indeed, 4,5 litres of gas oil/Ton, in 8 hours, are needed to heat the product).